“I Thought It Would Be Zombies…” Comic Crowdfunding Update #6; Drawn to Perfection – "I Thought It Would Be Zombies…"
Well, the 7 day payout window on my last “I Thought It Would Be Zombies…” update post expired about an hour ago, so it’s high time to move onto Update #6! What Exactly Are We Updating Here??? First, a quick recap for those new to our unfolding drama! “I Thought It Would Be Zombies…” is an independent comic book created and in production by yours truly, Bryan “the Imp” Imhoff. It follows a ragtag band of adventurers through the aftermath of a “magical apocalypse,” both humorous and horrific; beautiful and terrifying. Fundition is the first dedicated crowdfunding platform built on the Steemblockchain. Supporters can back projects with direct contributions of cryptocurrency, or by simply “liking” the posted content! On the Steemblockchain, your votes have value, and Fundition is designed to tally this value over the course of an extended campaign. “I Thought It Would Be Zombies…” is utilizing the Fundition platform as its source of funding, so friends and fans can earn rewards simply by upvoting update posts like this one over the course of the months to come! OK… So, What’s the Update? The “I Thought It Would Be Zombies…” Fundition Campaign officially started on August 14th, 2018 so at this point it has been running for just over a month and featured 6 total posts in the series. To date these posts have generated 167.988 Steem for the project funding. In addition, a number of individuals have also donated Steem tokens directly, to the collective tune of 53.266 Steem, for a grand total of 221.254 Steem of funding! At the time of this writing, that is equivalent to about $167USD. You guys all rock, thank you! Enough With the Accountant Impression, Let’s See Some Comics! 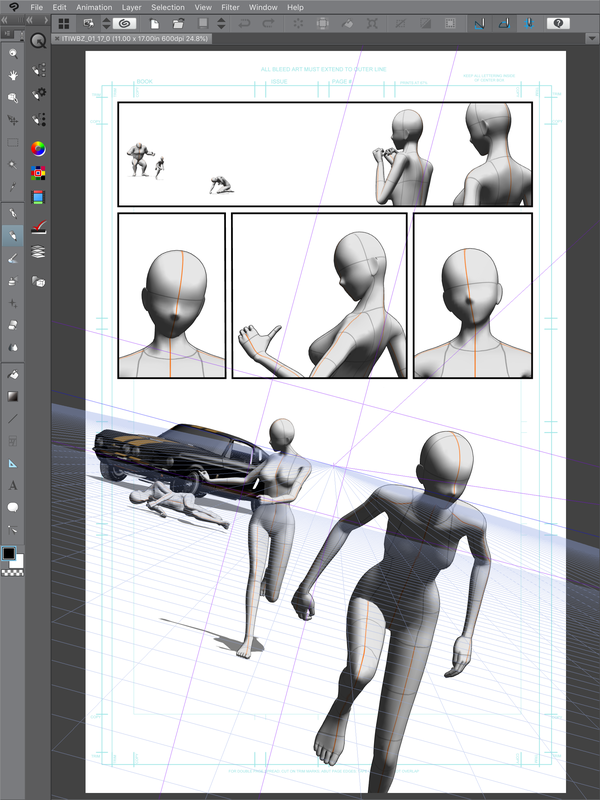 In recent posts, (like this) (& this) I’ve been showing a lot of the layout process that I’ve been working on which involves planning out pages using a combination of thumbnailing and then moving on to 3D modeled layouts in the Clip Studio Paint software. In the last few days I got the urge to move onto some actual illustration tasks, primarily due to seeing new work from @kommienezuspadt. He and I do our best to share work with each other on a weekly basis and it really does help with motivation. I’d felt bad coming to the table for a couple weeks with no actual “drawing” so I dove into the beginnings of translating a page from the 3D layout stage, into the pencils and inks of a comic book. Surprisingly, I’m rather pleased with how this is coming out. In a long endeavor like this, it’s nice to have those moments when you sit back and think, “Yeah, I can do this…” There are many rival moments of “Omigod, this looks terrible, I can’t do this!” so I’ll savor the wins! I’m learning on the page. There comes a point when you can’t sketch and study anymore, you just have to produce the work, ready or not. With luck the comic won’t be a stylistic and quality mishmash and actually appear unified, but I fully expect to get better as time goes by. One of the changes I’ve been working on implementing is taking my drawings a bit more “cartoony.” I want this story to be very animated and expressive and I think that’s really coming across well with the ladies on this page, Sarah, and Julie. I am slow… I get to be meticulous and a bit obsessive in my drawing. Just the drawing portions seen here took about 3 hours so far. (I had Toy Story 1 & 2 play through in the background as I worked… it’s a good gauge of time. I can use movies as my time clock punches!) I’ll personally be very curious to see what the time totals start looking like on my first few finished pages. 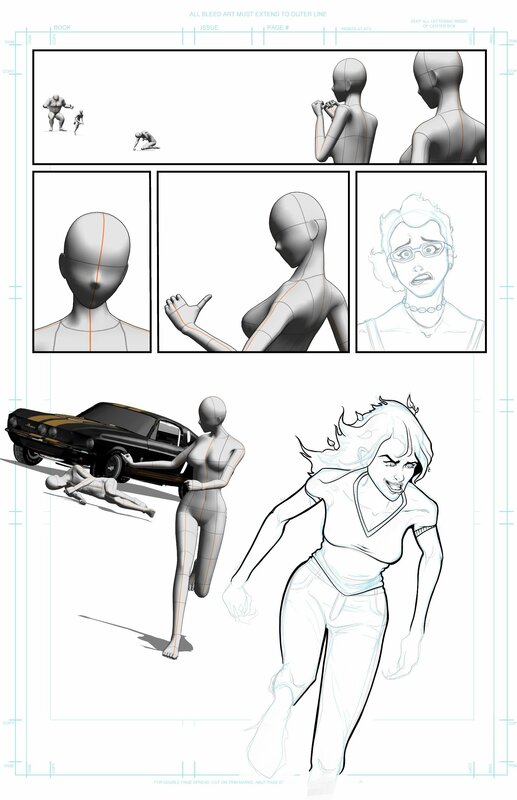 Between layouts, drawing and inking, colors and lettering… I’m guessing 20-30 hours per page will be in the ballpark. Comics can be brutal, but when you love ‘em, you love ‘em! Hope you enjoyed another look behind the scenes! In the near future I’ll also be working on further developing the official ithoughtitwouldbezombies.com website, as a centralized source of all the previews, art, news, and Fundition backer information! Just have to make some time… maybe if I didn’t re-ink the same line 9 times I’d be a bit more free. But what the hell, that line looks really good the ninth time around!